Festival Romanistica is an edited volume with 19 contributions written in four Romance languages: French, Italian, Portuguese and Spanish. The volume represents the whole range of research areas in Romance Linguistics today at the University of Stockholm: semantics, syntax, pragmatics, discourse analysis, diachronic linguistics, translation studies and second language acquisition and use. Five of the articles are written by renowned scholars from five European universities. 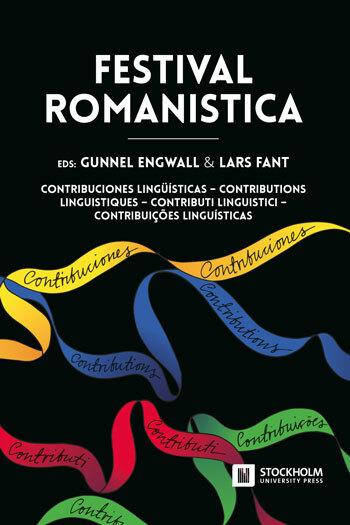 The authors of the remaining 14 contributions are doctors and supervisors belonging to the National Doctoral Program in Romance Languages (FoRom). By virtue of its wide scope and the high quality of its contributions, this volume is of interest for, and will find a natural audience among, researchers of all Romance Languages departments and divisions in Scandinavia, Europe and worldwide. Festival Romanistica is the first volume in Stockholm Studies in Romance Languages, which is a peer-reviewed series of monographs and edited volumes. Gunnel Engwall is Professor of Romance Languages, especially French, at Stockholm University. She has been Vice-Chancellor of Stockholm University and President of the Academy of Letters, Antiquity and History and is presently the Head of the National Edition of August Strindberg’s Collected Works. Lars Fant is Professor emeritus of Romance Languages, especially Spanish and Portuguese, at Stockholm University. He is the also Chief Editor of the series Stockholm Studies in Romance Languages. El creciente interés por la lingüística románica en Suecia queda reflejado en los 19 capítulos de Festival Romanistica, escritos por estudiosos provenientes de España, Francia, Italia, Portugal y Suecia. El volumen abarca un amplio abanico de trabajos que cubre áreas esenciales de la lingüística románica: sintaxis, semántica, pragmática, traductología y adquisición de segundas lenguas. L’intérêt croissant pour la linguistique romane en Suède se reflète dans les 19 chapitres de Festival Romanistica, écrits par des chercheurs venant d’Espagne, de France, d’Italie, du Portugal et de Suède. Le volume comprend un riche éventail d’études couvrant des domaines essentiels de la linguistique romane : syntaxe, sémantique, pragmatique, traductologie et acquisition des langues secondes. Il crescente interesse per la linguistica romanza in Svezia si riflette nei 19 capitoli di Festival Romanistica, scritti da ricercatori provenienti da Francia, Italia, Portogallo, Spagna e Svezia. Il volume ospita una ricca collezione di studi appartenenti ad ambiti essenziali per la linguistica romanza, quali sintassi, semantica, pragmatica, traduttologia e acquisizione delle lingue seconde. O interesse crescente em linguística românica na Suécia reflete-se nos 19 capítulos de Festival Romanistica, escritos por pesquisadores de Espanha, França, Itália, Portugal e Suécia. O volume apresenta um leque amplo de estudos cobrindo áreas essenciais da linguística românica: sintaxe, semântica, pragmática, tradutologia e aquisição de segundas línguas. Los apéndices conversacionales en la argumentación: el caso de ¿cachái?